Plans for the expansion of Enid’s Trail system were reported in the March 14 edition of The Enid News and Eagle. Matt Davis, a member of the Enid Park Advisory Board, commented on the City’s plans for the next phase of the trail system. He said that costs will be covered jointly by the City and the Oklahoma Department of Transportation. 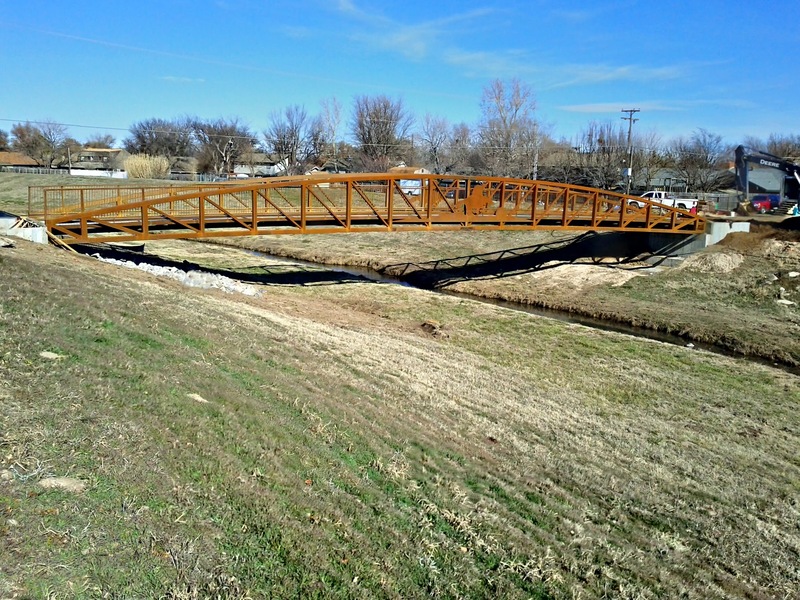 The OK DOT has required that the trail system connect commercial, public, educational and governmental sites through out Enid. It should meet recreation and transportation needs. You can find the complete plan (PDF) at the City of Enid’s Website. And looking at the maps this phase is just the beginning. This phase should connect the East Side with the West and likewise, the North and the South sides of Enid. Initial work to be from Parkway in Indian Hills to Oakwood and then continue from Oakwood to Garland. This trail should follow and old rail road track that no longer exists but the right-of-way still exists. On the PDF this would be trail number 3, The Rail Road Pass Trail. Future plans are for a trail that starts at the western end of The Rail Road Pass Trail and heads North into Cedar Ridge. Again, on the PDF, this is trail number 5, The Track West Trail. A trouble the planners and builders have is how to cross West Owen K. Garriot (US 412) safely. This is the last traffic light in town and drivers are eager to get up to full speed and get out of town. Also on the City’s to-do list is trail number 9, The Channel Fairway Trail. Initial plans are for it to start close to midway of trail 3 and head North to Chestnut Ave and beyond to Crosslin Park using trail number 12. Number 12, The Farmland Express Trail, is a necessity. If you want to get to the Jumbo Foods shopping center from the South you must use Cleveland. This road is fast, 45 MPH, and narrow. This road is not safe. Having a trail that gets pedestrians and cyclist off Cleveland is a big deal. And it will be see lots of traffic. The Southgate Lane Trail, number 13, travels from Meadowlake Park in South Central Enid to Vance Air Force Base will remove travelers off South Cleveland. Presently, there are lots of cyclist and runners who get to Vance on South Cleveland. While this stretch is a bit wider than up North it is just as fast. I have to commend the City for wanting to make Cleveland safer. I know that I will be a heavy user of this part of the trail system. And to connect the South East side of Enid, they are building the Government Gateway Trail, number 15. This will start on the far East end of number 3 and turn North towards East Owen K. Garriot and Independence Avenue. The City plans to use the Old Santa Fe Depot as a trail headquarters. This is a local land mark and shares parking with our farmer’s market. This will be the first leg to allow people to get to Enid’s downtown. Like many towns, the downtown holds government buildings as well as shops and convention centers. In my opinion, the City is doing the right thing. Giving it’s citizens the choice and liberty to get around town safely is outstanding. As transportation cost keep rising having choice on how one can ‘get around town’ is forward thinking. Once this trail system is complete, people can choose from their our personal automobile, taxi service, the Transfer Bus system and this trail system. We are all aware that walking and cycling to work are a good alternatives to a gym membership. Why waste that time each day sitting in traffic, literally sitting. Getting your heart rate up while transporting yourself is like a second cherry. While poking around the blogoshere this morning, I may have found evidence of what we all know is true. The folks at ecovelo.org and dc.streetsblog.org have articles discussing the findings that were published in the American Journal of Public Health from researchers at Rutgers, Virginia Tech, and the Centers for Disease Control and Prevention (CDC) that show a clear link between high levels of walking and bicycling to work and positive health outcomes. Active commuting alone will not be that magic pill we all seek. But along with eating right, active lifestyle and other factors, walking and cycling can contribute to lower rates of obesity and diabetes. Does your city or town promote walking or cycling to work? If it did, would you walk or bike more? My family and I just returned from a three city trip. We visited Las Vegas, New York City, Providence-Boston Area. I count Providence-Boston as one because we found ourselves between these cities most of this part of our journey. I found something kind of different as in, how people on foot and on bikes are treated by motorized traffic. First let me explain how it is here, in North West Oklahoma. Cars rule. Drivers feel entitled to the complete road. There is no room for anyone or anything else. Drivers have told me that bikes and pedestrians don’t belong on the road. That is what the sidewalk is for. Las Vegas handled the foot traffic well. They provided large sidewalks and bridges spanning the strip. Also crosswalks were jammed with people. I understand that Las Vegas is predominantly a tourist town. People need to get between casinos/hotels for lots of reasons. And Vegas accommodates them. As bikes go, I didn’t even see a one. Can I assume that they are on the parallel streets? I hope so. I felt pretty safe walking in Las Vegas. In New York City, the walker and biker rule. Automobiles are the slowest way to get around Manhattan. We found ourselves in a sea of people walking many times. There is a give and take with foot traffic and cars. As long as each follows the rules, everyone is happy. But if someone steps off the curb before it’s time, a car,bus or truck horn is heard. That being said, most NYC drivers are very courteous. It’s like the drivers understand that they are not going anywhere fast. But for them, they enjoy their own space in comfort. Listening to their own sitting down, listening to the radio, drinking coffee, and enjoying the air conditioning. Cyclist find themselves part of the traffic. They weave in and out of the taxis and busses. Sometimes to the scorn of the drivers. Cycling NYC is simply the fastest way to travel. But it is the most wild. If a cyclist is brave, he or she can make great time. That’s even following the rules of the road by stopping at red lights. My only experience on a bike in NYC, was when we rented them at Central Park. Now we didn’t leave the park, but we did follow the marked bike paths. There were walkers, runners, bikes and cars. It all flowed well. We never felt threatened. We felt we could go anywhere in the park that we wanted to, no limitations at all. Not getting out on the streets by bike, I can’t say how safe I felt; but I felt pretty safe walking in New York City. We stayed with family in Massachusetts. They don’t live the the ‘city’. The roads are the typical narrow winding roads with no shoulders. When my wife and I walked the roads, cars gave us the full lane. It was outstanding! They would slow a bit and move to the other lane. We generally walked against traffic unless there were sidewalks, which were few. We walked mostly during the day, and not at night. We were afraid the drivers wouldn’t see us at night. There where no street lights at all. When we were in either Boston or Providence, I saw lots of bike lanes and folks using them. We even saw families who rented bikes to tour Boston. Boston and Providence are bike friendly. Also for us walkers in the two cities, it was just like New York. But on a much smaller scale. There were lots of sidewalks and mutual respect between drivers and walkers. While in Boston’s North End, we found ourselves walking down the middle of the streets. Most because we could. The very narrow streets, sometimes single lane, had very slow moving traffic. I felt pretty safe.